Wondering what to do with all those preserved lemons you either made or were given at the holidays? Are they taking up room on your counter or refrigerator door? Worry no more. For once, Ottolenghi has devised a recipe that works on the first go without tweaking. His talent for combining flavors that sing in unusual harmony is better known in London where he lives and works than in the U.S. He deserves a lot more attention. This recipe is a freebie. You can find it here on the Guardian website. You’ll see a lovely photo of the completed dish. I’m supplying it here because I made it with the very first eggplants I ever grew and realized afterward that it was a fitting use of them. Over a couple of days, I made the recipe without the bulgar salad. The eggplant taste great just on their own. 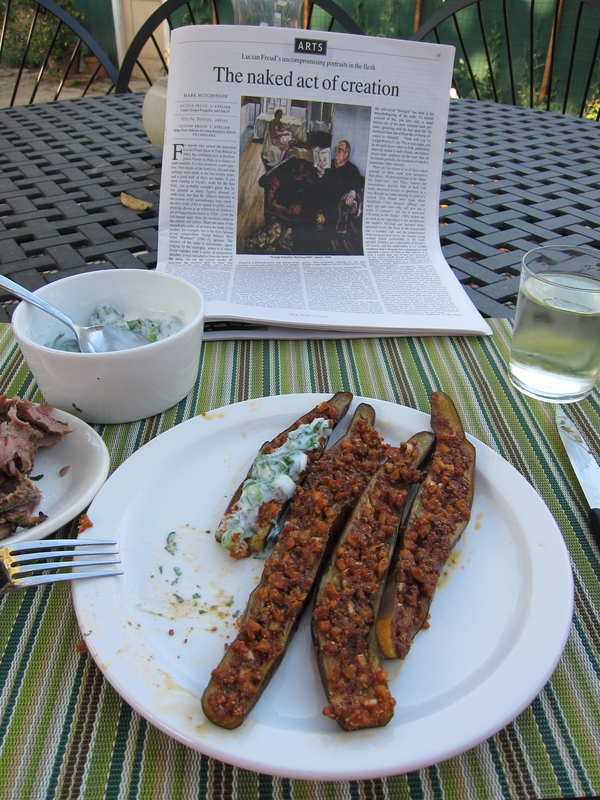 In the photo, you’ll see that I baked the eggplant and ate it with the remaining spices, olives, and yoghurt. I highly recommend this recipe. Preheat the oven to 180 C/350 F/ gas mark 4. To make the chermoula, mix together the garlic, cumin, coriander, chilli, paprika, preserved lemon, two-thirds of the olive oil and half a teaspoon of salt. Cut the aubergines in half lengthways and score the flesh of each half with diagonal, crisscross lines, making sure not to pierce the skin. Spoon the chermoula over each half, spreading it evenly, and place on a baking sheet. Roast for 40 minutes, or until the aubergines are very soft. Meanwhile, place the bulgar in a large bowl and cover with 140 ml [1/4 cup] boiling water. Soak the sultanas in 50 ml [2 tablespoons] of warm water for 10 minutes, then drain and add to the bulgar, along with the remaining oil. Stir in the herbs, olives, almonds, spring onions, lemon juice and salt, taste and add more salt, if necessary. Serve the aubergines warm or at room temperature. Place one half-aubergine per portion on a serving plate, spoon bulgar on top, allowing some to fall over the sides, spoon over a little yoghurt, sprinkle with chopped coriander and finish with a dribble of olive oil.